Join the discussion on our forums! Come discuss Da Undatakah over in our dedicated Da Undatakah discussion topic. Immortal Prelate, Silver Vanguard, Spikeridged Steed. Your opponent now either has Silence, a lethal amount of spells, or an alternate win-condition, and if they don't they get to see how long they can last against a 10/11 minion with Taunt that will constantly resurrect itself instantly upon death, as well as drop a 2/6 with Taunt every time it dies. Rotation cannot come fast enough. Am I misinterpreting this card? "Battlecry: Gain the Deathrattle effects of 3 friendly minions that died this game." If i silence then proceed to kill the Astral Tiger and Hadronx, so that their deathrattles never proc. Shouldn't Undatakah not have those deathrattles? I did just that and he had both deathrattles available to him. I find that interaction inconsistent with the card text. Maybe its just me. It gets the Deathrattle of minions that died (even if they have not been proc'ed). It gets the effect even when the minion was silenced, as long as it has died before Da Undatakah is played. Transform effects (Polymorph, Hex, ...) do not count, so Da Undatakah does not get those effects. Just found a new interaction. If this gets eaten by Gral, the Shark, when it dies, it gives another Da Undatakah. Such value! Where are the bells when played? EDIT: Oh nvm, Prelate keeps the Taunt enchantment. Neat. I could see this used with Meat Wagon and pulling a minion with less than 8 attack! If I had say 5 Deathrattle minions die do the first 3 that were played or died get added or are they chosen randomly? So overhyped. Cool card but only playable in long control games and even so there are better options for those high mana spots. Thinking specially in Wild. Best flavor text of the expansion, no equal. Jim Ross voice recalled: "He might be broken in half!". A question, how would this work with Immortal Prelate ? based on the the text because it doesn't say different friendly minions, it could copy more times that deathrattle (in case it was killed twice of course) but still only shuffling once? (That's what I think would happen, like when you have brann on board and play a minion with the battlecry of return a minion to your hand) or I'm understanding the interaction wrong? The Brann and Brewmaster effect that bounces a minion back only happens once because you don't get to choose a second target. I believe if you copy the Prelate deathrattle twice it would shuffle once per deathrattle that shuffles. So having two Prelate deathrattles should shuffle two copies of Undatakah. What I'm curious to see is if Undatakah copies shuffled keep enchantments as well, because it's part of the Prelate deathrattle so I imagine that it would. And those added deathrattles should count as enchantments, right?! If they do you'd get the battlecry for the initial three deathrattles. If at least one is Prelate's, it should shuffle with those three deathrattles still on it, then you draw and play it again to gain more deathrattles, making it six total... It could snowball to some crazy OTK if you are able to play a slow enough deck. 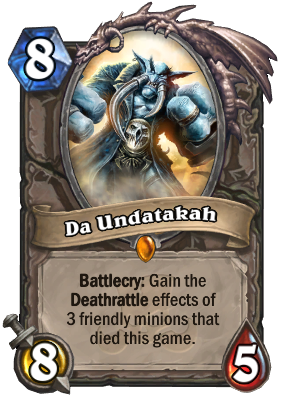 Would be mostly meme worthy because it's ruined if you don't get the Prelate deathrattle, but mix in stuff like Rotten Applebaum, Leper Gnome... you get constant healing and enemy face damage, plus more and more Undatakah's from Prelate's deathrattle... Immortal Undatakah Paladin!! !